Despite of being well secured, WordPress website still risk to be hacked. Basically, hackers always find gaps in WordPress websites` defense only because of the human factor. It means that some of our actions can open doors for hackers and soon or later these doors will be used. Beginners in the field of WordPress administration often make mistakes towards the security of their projects. Today we will analyze the main mistakes and proven ways to avoid them. Even if you are an experienced WordPress administrator, it would not be excessive to check all the items we will mention in this article. If you only start your WordPress project, then it is crucial to pay attention to all of the listed actions. It would not protect your website for 100 percent rate but will cut off the most dangers your website can face from hackers. The listed actions are also important to get the overall understanding of how WordPress security works and how to avoid the unwanted hacker access to the heart of your project. Although WordPress is often considered as the website platform for beginners, it has lots of opportunities for advanced fine-tuning. These options are mostly hidden from a sight of most WordPress administrators just because a thoughtless manipulation with them can cause severe problems in the work of your website. There is no need to worry about your website safety, if you have done a back-up before customizing your WordPress configuration file. Today we are talking about WP-Config file and its hidden opportunities to fine-tune your WordPress website. Most WordPress administrators had no experience with WP-Config because most hosting providers install it automatically to prevent any harm by inexperienced website owners to their own projects and to minimize the consequential damage. The wp-config.php file has lots of opportunities not only for fine-tuning your WordPress options but also for troubleshooting and enchanting your website security. If you want to know more about WordPress platform from inside and seek to develop your website in a professional level, then this article will be very useful for you. Arm yourself with your website back-up and any of available FTP clients (FileZilla, for example) and hop into the world of extended WordPress configuration! Malware always evolves and sometimes even takes new forms. Unfortunately, any computer or website can not be absolutely protected due to this fact. Although WordPress is one of the most secured platforms in the modern internet, there is always a chance to get some malware and suffer from the consequences. 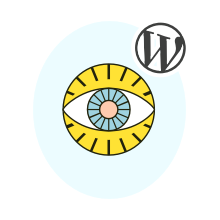 One of the experienced WordPress protectors — Wordfence — has recently informed community about a new malware which appears to have a new modus operandi compared to the known analogs. This new malware is called BabaYaga and it stands out with the feature to delete any other malware your WordPress website could have received earlier. Why BabaYaga is deleting other malware and what harm can it bring to your WordPress website? This article will inform you about these important questions. We have also gathered the common protection measures which you can use within your WordPress website to detect and resist BabaYaga. Stay informed with LooksAwesome! General Data Protection Regulation (or GDPR) is a new regulation passed in European Parliament and taking action from May 25th, 2018. GDPR aims to strengthen the personal data protection policies held by websites situated in European Union. This new regulation is important nearly for any WordPress project, as most of them are collecting and storing some personal data from their users, subscribers and members. Even the IP address is considered as a user`s personal information. We have dedicated this article to the nuances of new General Data Protection Regulation statements, the situation it might affect and the actions any WordPress website owner should take to prevent the enormous fines which are envisaged by the new law regulation. This information is crucial for every WordPress admin, so you should not miss your chance to familiarize yourself with this aspects as soon as possible and take action beforehand. Internet is an open space where there are not only polite and law-obedient persons. Image theft has become a very spread issue through internet in common and between WordPress websites particularly. Every day and every minute hundreds and thousands of photos and pictures become stolen and travel from one thief to another. But there are some ways to prevent the image theft for your WordPress website. This article is very important for any copyright owners of visual content. If you create the original art works or simply draw images for your articles and do not want them to be used for free by another websites, then we suggest you to read the following 4 methods of preventing illegal copying of your images from the WordPress website or blog. WordPress secure connection error is one of the common issues any website administrator can face. So it is important to know what causes such an error and how to deal with it. As WordPress is a large web platform with lots of additional plugins, tools and extensions, it is not always obvious where to look in case of errors. In this article we will analyze the possible reasons of secure connection error within a WordPress website and the methods to fix this issue. The article will be helpful for the beginners in the sphere of WordPress administration and development. Security has always been one of the most important indicators of the site`s success. Security ensures the stability of your internet project, the level of safeness of your data and the degree of site visitors care (no one wants to visit dangerous sites and get viruses). The good news is that any site on the WordPress platform initially has an excellent safety level. This achievement is reasonably because of constant work of WordPress experts over the safety of the projects on this platform. As soon as there is a definite threat, WordPress admin panel offers to download updates to protect your site. It is really well-honed and reliable system. So why there is a need to write about WordPress site security? It is all about the human factor. Lack of experience in site administration, reckless installation of plugins, add-ons and themes from untrusted sources, and the use of poor hosting – all these factors can threaten the security of your site even on a proven and reliable platform like WordPress. Let’s try to figure out how to secure your internet project from yourself. Website security is becoming more and more important everyday. There are some simple steps anyone can take to defend against hackers and minimize vulnerabilities. It’s important to keep WordPress secure to protect your website from harm for a number of reasons. You can increase uptime, keep your data safe and make sure your site is in good working order. WordPress is one of the most popular CMS on the internet. The best thing you can do when building a website through WordPress is make sure that it is secure enough. It is also true that you can never get your website security up to 100% but can definitely go for 99% milestone. This can also be accomplished by considering some small and big security factors while development. Having a WordPress website owner means that you need to take some extra care of your website in order to secure your and as well as visitors data. WordPress website development includes a wide range of free and premium themes, plugins and widgets for different purposes. These themes, plugins and widgets developed by the vast WordPress developer community around the globe. Below we’ll explain some tips to secure your WordPress website from majority of attacks.